The Anhinga is a curious bird of ancient origin that hunts while swimming fully submerged for fish, which it spears with it's sharp beak. 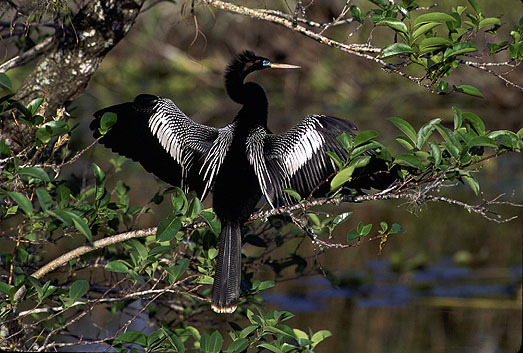 In order that it may dive and remain submerged with less effort the Anhinga does not oil it's feathers like other water birds. As a result their plumage becomes completely soaked when they enter the water. After feeding they must dry out, as this one is doing, before they can fly any distance.